- FUN AND FUNCTIONAL: With easy carry handle gray one & waterproof royal blue one combo, 2-in-1 stuffed animal holder is perfect for storing all your kid's soft toys so you can keep your home organized and tidy. - LARGE SIZE: Store up to 50 stuffed animals, dolls and plush toys (not included) or even pillows and blankets. 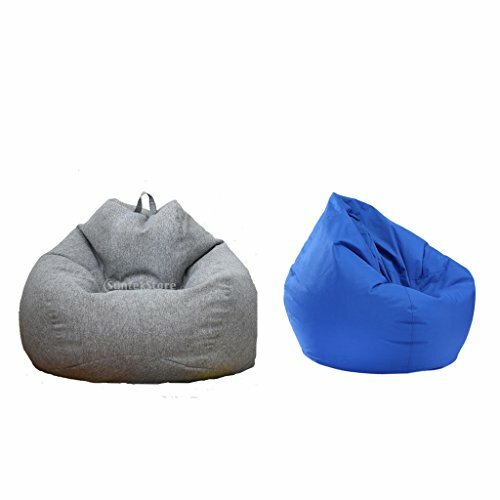 - MULTI-PURPOSE: Storage bag works just a like a bean bag chair and is a great alternative to toy hammocks, nets, bins. - CONVENIENCE AND QUALITY: Premium durable canvas with extra-long zipper, and a white inner lining cover (which can storage bean bag filling polystyrene beans, so you just need to wash the cover only when it's dirty). - DESIGN: Modern solid color design will look great in every bedroom or playroom and it is great for adults, boys and girls! Gray one is not waterproof and royal blue one is not with handle, thank you. FUN AND FUNCTIONAL: With easy carry handle gray one & waterproof royal blue one combo, 2-in-1 stuffed animal holder is perfect for storing all your kid's soft toys so you can keep your home organized and tidy. LARGE SIZE: Store up to 50 stuffed animals, dolls and plush toys (not included) or even pillows and blankets. MULTI-PURPOSE: Storage bag works just a like a bean bag chair and is a great alternative to toy hammocks, nets, bins. CONVENIENCE AND QUALITY: Premium durable canvas with extra-long zipper, and a white inner lining cover (which can storage bean bag filling polystyrene beans, so you just need to wash the cover only when it's dirty). DESIGN: Modern solid color design will look great in every bedroom or playroom and it is great for adults, boys and girls! If you have any questions about this product by non-brand, contact us by completing and submitting the form below. If you are looking for a specif part number, please include it with your message.